Isn’t it devastating when one of your heroes slips off the pinnacle? For me, John Le Carre is the definitive author of the Cold War spy story; compared to his novels, the work of the other stars of the genre seem shallow Boy’s Own adventure yarns. 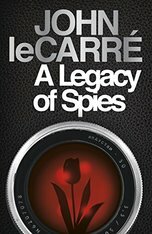 So I began reading the long-awaited ‘A Legacy of Spies’ with high hopes. My hopes weren’t exactly dashed, but they weren’t quite fulfilled either. It’s perhaps an impossible task to retell an old, well-known story and maintain the high electric tension you achieved the first time. Wrapping up ‘The Spy Who Came in from the Cold’ story in the topical scenario of a damages lawsuit just doesn’t quite cut it for me. The characterisation is outstanding, as you would expect, and the sinister organisational presence is as threatening as ever. It was the ending of the book that left me feeling let down. It wasn’t so much a resolution of the plot as an abdication from it. It gave me a bit of a feeling that the author had no more to say and, like the main character, just decided to go home. Don’t get me wrong, Le Carre is a maestro and it’s still a five star, ten out of ten, novel. It’s just that I had been expecting a twelve out of ten from him.